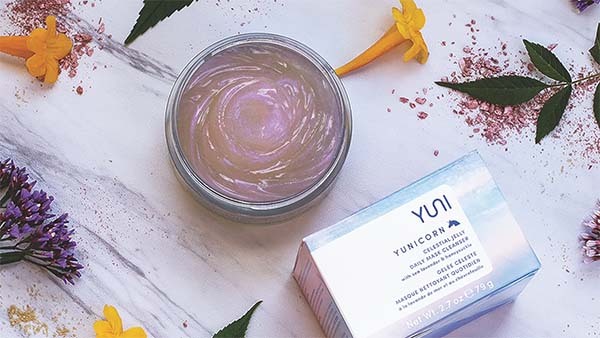 Why We Love It: Yuni Yunicorn Celestial Jelly Daily Mask Cleanser is a unique luminescent gel to milk formula that will leave your skin feeling purified and silky smooth. Whether you are doing a quick rinse or a relaxing mask ritual this daily cleanser is perfect for you. Sea Lavender, Rice Bran Extract and Honeysuckle help to maintain healthy skin while providing tired skin with a surge of deep moisture. To use as a mask: Apply as above but allow the gel to remain on skin for 1-2 minutes before rinsing. Do not get water into jar. For external use only; avoid contact with eyes. YUNI, Mindful Beauty for an Active Life. YUNI was founded by natural beauty pioneers and yoga teachers, Emmanuel Rey and Suzanne Dawson. YUNI gives active people who pursue life with passion, healthy natural solutions that save time, enhance performance and relieve stress, so you can do more, live more and find more joy in every moment.